Last December the Arizona Corporation Commission (ACC) set a $5/mo “opt-out fee” for analog meters as well as a $50 initial fee for those customers who wisely do not want invasive smart meter technology attached to their homes. The ACC decision was disputed by interveners and following “legal advice,” on Monday April 13, 2015, the ACC, in an unprecedented fashion, completely “abrogated and rescinded” the December 2014 decision. Bottom line, Arizona Public Service (APS) customers may not be assessed any fee for refusing a smart meter until the issue is completely revisited “afresh.” If the APS wants to charge customers a fee for refusing smart meters, it will have to apply for such relief in a new rate case. http://www.azcentral.com/story/money/business/2014/12/12/state-settles-smart-meter-debate/20343257/ for prior news story. Also at issue is whether smart meters are “safe.” As reported at this website, a state study did not establish that Arizona smart meters were safe, only claiming that smart meters were “not likely to harm the health of the public.” In addition, in early December 2914, SkyVision Solutions submitted comments to the ACC outlining how the state study on smart meters conducted by the Arizona Department of Health Services (ADHS) was seriously flawed. This is at least a temporary victory for the people of Arizona, and it shows how the efforts of a few people can make a difference, in this case, with special credit given to Warren Woodward of Sedona, Arizona. No doubt the utility company will again start the process to request customers pay a fee to avoid its so-called “smart” meters. This would be unfortunate. On the contrary, the utility should consider halting its deployment altogether. As pointed out here at this website on many occasions, the risks far outweigh the benefits. It is apparent that the ACC commissioners fear legal repercussions of their actions from December 2014 and where they realize they have not yet fully considered the best interests of the consumer. “Woodward said despite the decision, the regulators continue to avoid discussing specific concerns with the meters, focusing narrowly on fees to avoid them. For example, regulators are not considering the health effects of the meters on neighboring homes when a customer opts out of using a smart meter, he said. Below is an audio excerpt of the ACC staff meeting where the December 2014 decision was completely rescinded. For those with an extra 5 minutes, it would be worth the time to understand the full context of the Arizona decision. 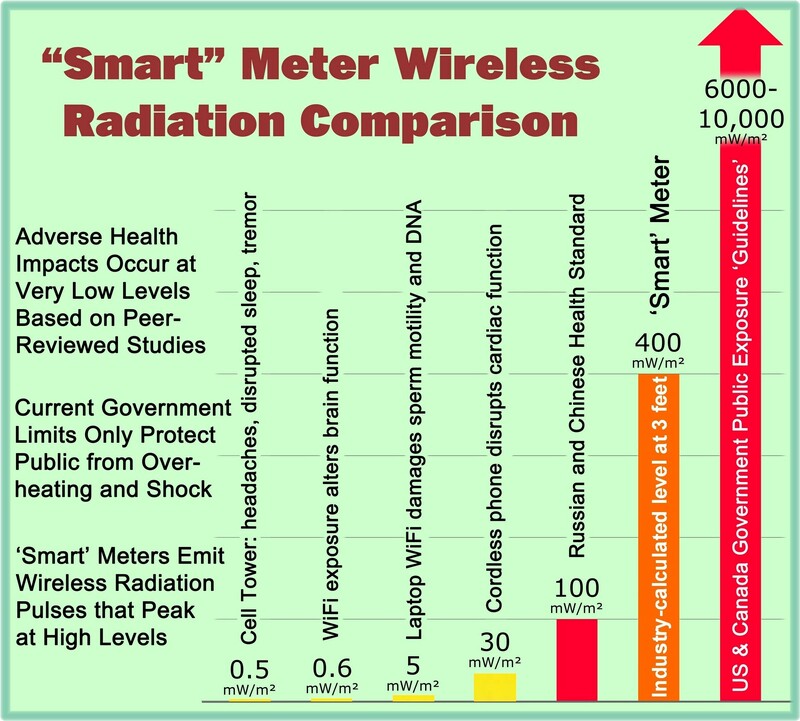 This entry was posted in Smart Grid, Smart Meters, and RF Emissions and tagged Health Effects, Invasive Technology, Opt-Out, Smart Meters. Bookmark the permalink. As of November, 2017 I have been charged an opt-out fee of $5.00 by APS. What has changed? How can they do that? There is already a meter reading charge. – Effective October 1, 2017, any residential customer who requests a non-standard meter at their home or service address will be charged a $50.00 upfront fee per meter exchange. – Effective November 1, 2017, residential customers who have a non-standard meter will be charged a $5.00 monthly fee on their bill for maintaining the non-standard meter. The $5 fee is generally thought of as the fee to read the meter manually. I am not familiar with another separate charge for reading the meter.